In December, Ghana joined the ranks of Africa's oil producers - it now expects its economic growth rate to double. The BBC's Rob Walker went to Takoradi, the hub of the new industry, to see how a once-sleepy city is changing. He plans to return regularly, to build a portrait of a society in transformation. On the western edge of the Ghanaian city of Takoradi, newly built villas with wide verandas are rapidly eating into green forest and farmland. For Takoradi's ambitious new entrepreneurs like Peter Abitty, there is opportunity here. Mr Abitty is a real estate agent with a bright pink shirt, and an even brighter smile. He shows me round an eight-bedroom house looking out onto the sea, surrounded by banana trees and coconut palms. Yours for $5,000 (£3,000) a month - five times its rental value a couple of years ago. "Tenants that come here can take the coconuts for free! We don't charge anything," Mr Abitty says. Already there has been lots of interest. "The reason is very obvious." The estate agent points over the horizon: "It's out there: oil, oil, oil." Ghana made its first big oil find off the coast from Takoradi in 2007, and turned on the taps late last year. 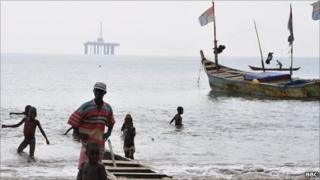 The discovery may not be on the same scale as the African oil giants, Nigeria and Angola. But it is enough for the government to forecast that the rate of economic growth will more than double from 5% last year to as much as 12% this year. And unlike those countries, Ghana enjoys a reputation as one of Africa's best governed states. Takoradi, a dusty, run-down port city, is the hub for the new industry. But it is not just international oil companies that are booming here. "In five years time, I see Takoradi becoming one of the modern cities of the world," said Alfred Fafali Adagbedu, owner of Seaweld Engineering, one of the many new local companies set up to service the oil sector. "I can imagine skyscrapers, six-lane highways and malls." Mr Adagbedu left a job in Equatorial Guinea and came home to Ghana after oil was discovered. "The transport industry is going to improve, because workers on the rig are going to need to be transported. Agriculture is going to see a boom because all those people on the rig will need to be fed." "Even market women are going to see more business, because a lot of workers are going to have very fat pay checks. Everyone in this city is going to gain in business." It is a boost the city badly needs. At the once-thriving railway station, washing hangs from a train that has not moved in years. Squatters have moved into the sleeping car. Once the trains stopped running, many businesses ground to a halt as well. The city authorities now want to reverse this decline. They want to demolish part of the city centre and redevelop it with high-rise buildings to provide more space for new businesses attracted by the oil find. It would mean several hundred existing residents being relocated. "There should be some sacrifice, if we want to move ahead as a metropolis. But I believe with proper education they will understand," said city assembly member John Davies. The redevelopment will take at least five years, and will depend on the city finding the necessary investment. But for many residents, Takoradi has already changed. New traffic jams clog up the streets at rush hour. Hotels are fully booked. The price of goods has risen, and rents for many residents - not just those in luxury villas - have spiralled. In one of the newly built parts of the city, I meet Efua, a teacher. Efua's landlord told her the rent on her house was going to double. When she couldn't pay, she came home to find an eviction notice posted on her door. "He's giving it to the oil people, because he knows that as a poor teacher I can't get money to pay such a huge amount," she said. A few months after oil production started, it is already clear there will be losers as well as winners in Takoradi. Despite rising expectations, only a small proportion of young people leaving higher education in the city are likely to get jobs from oil. That is why local leaders want 10% of the estimated $1bn a year the government will receive in oil revenues to be used for developing Takoradi and the western region of Ghana. "Many resources are coming from the western region. From years back, gold is here, timber is here, diamonds are here," said Nana Kofi Abuna V, one of the few female chiefs in the area. "But when they share the cake up there, they leave out the western region. This time, if there is oil and gas in the region we should benefit more than everybody else." But a national strategy for managing the oil revenues is not yet in place. Some worry that the "oil curse" could strike Ghana as it has Nigeria, where oil has been used to fuel conflict and corruption. Alfred Fafali Adagbedu, who owns Seaweld Ghana, doesn't share those fears. "I'm very sure we will avoid the mistakes. Ghana is a democracy, everyone is watching, so there is going to be a lot of improvement here." For some in Takoradi, there are more subtle fears about the future. "Sometimes I get confused myself whether I love the slow, easy nature of the city, or if I want to see the improvements," said Melody FM presenter Nana Otu Gyandoh. "I'm scared at the rate things are changing. Girls my age are not interested in the likes of me. They want to hook up with a white man. Our social set-up has been shaken and we are yet to come to terms with it." Takoradi is changing in ways many people here are not yet sure they understand. There is ambition and expectation, but there is also uncertainty about who is going to gain and who is going to lose now that Takoradi has become an oil city. Rob Walker's radio documentary on Takoradi will be broadcast on Assignment on BBC World Service on Thursday 10 March. You can listen again online or by downloading the Crossing Continentspodcast. You will also be able to follow the fortunes of Takoradi over the next few years, as we return to the city to track the people you meet on these pages.